Like every morning, Kedy, a young entrepreneur from a small PR agency in Shanghai, gets dressed, dresses Jiggly Puff and takes a taxi to the office. Jiggly is her two-year-old dog. Today she wears corduroy overalls with drawings of hearts on a white shirt. Kedy wears a plaid shirt and pants. Animals are not allowed on Shanghai’s subway and public buses, so Kedy travels daily to the office by taxi. She uses an app to call the taxi where she can learn if it accepts dogs: “Once I had to get off,” she clarifies. She goes to work with her pet every day. On the floor, at the entrance to the office of a low house with patio in the French Concession in Shanghai, there is a pink puffy for Jiggly to take a siesta next to a bowl of food and another bowl of water. Behind, several outfits for the dog hang in a coat stand. Kedy sits in her chair, switches on the computer and Jiggly jumps on her legs. While contacting the clients, the dog rests on her knees. Since she started the business, she has told her eight employees that they are allowed to bring their pets to work: “To create a more relaxed environment,” she explains. Occasionally, another worker comes to the office with his pet, a Japanese dog. 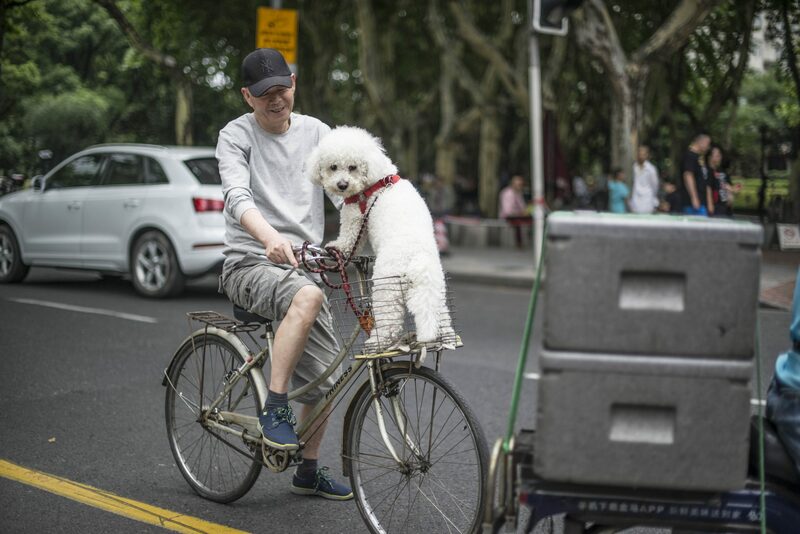 The rise of China’s middle class in addition to the changing attitudes toward animals has led millions of people to devote more attention (and money) to their pets, especially in urban areas. In the heterogeneous and diverse China, where there is still a dog meat festival in the southern city of Yulin, others take their dogs to the spa or a psychologist. Acupuncture for dogs, cremations and cemeteries, spas, hair salons, dogs crossing the road in arms of their owners or special carts, dogs wearing shoes, backpack, shirt and pants with diapers. 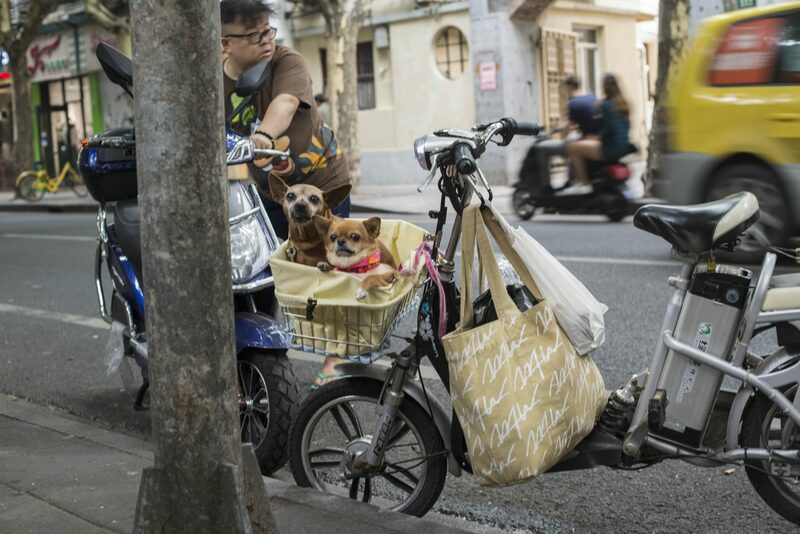 The streets of Shanghai are a catwalk that shows China’s pet industry is booming. 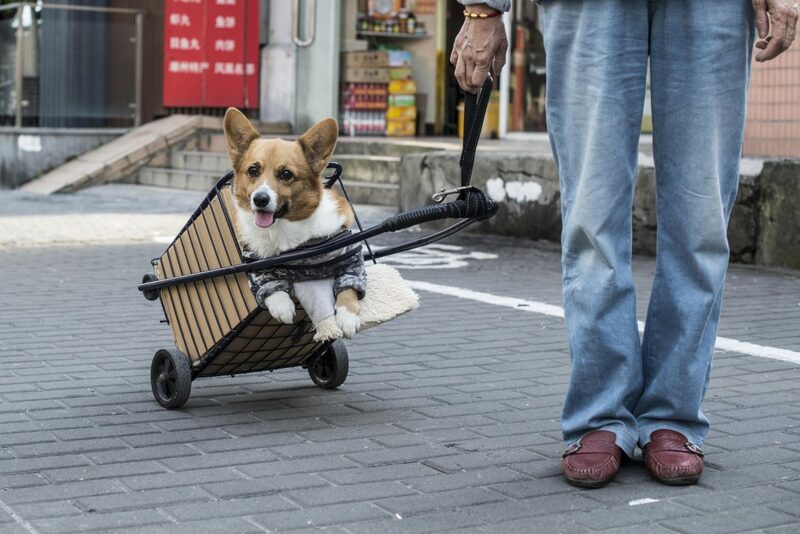 Last year, the Chinese spent 170.8 billion yuan (EUR 21 billion) on their pets, 27 per cent more than the previous year. The US pet market is currently higher (44.4 billion dollars) but only grows by 2 per cent, Reuters highlights. 73, 55 million people raise pets in China. 33.9 million of them have dogs, according to the 2018 China Pets Industry White Paper report, published by the pet services company “Lingdang Pet’”and Pet Fair Asia, in Shanghai last August . This survey estimates that each dog costs its owners about 5,508 yuan (695 euros) yearly on average in China. 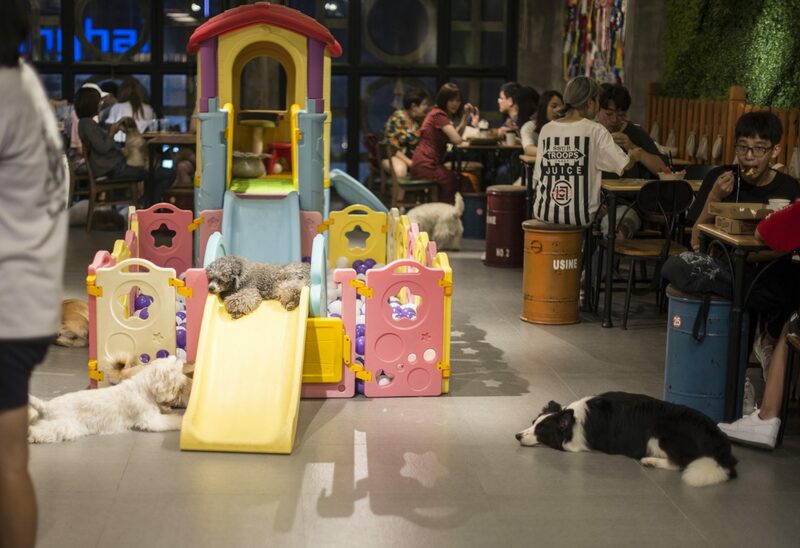 In Chinese cities such as Shanghai, pet services and animal-friendly cafes multiply, like Moka Bros, where every Sunday dog adoption is offered. In Canil, a cafeteria with swings for dogs, at 1933 Old Millfun, it is possible to enjoy a drink while the dog plays in the ball pool. In Catatom, you can find a psychologist for cats with depression and an“au pair” to take care of them when you go out. Moreover, the Shanghai Traditional Chinese Medicine Neurology and Acupuncture Animal Health Center, an acupuncture centre for cats and dogs, treats kidney or stomach problems of pets for 260 yuan (around 33 euro) each session. In Shanghai’s street, it is not rare to find amateur vendors with puppies in boxes. If there is a market around those who profess love for their pets, there is also a market for those who have to say goodbye to their best friends. According to Reuters, there is a pet cemetery in Beijing, the Baifu Chongwu Tiantang cemetery, where the tombstones recall the dog’s face taken from photos. There are also companies in China that offer cremation service for dogs, like Shanghai Shiyou. Jiggly Puff’s owner usually buys clothes for her dog online. On Taobao, the e-commerce giant, the Chinese Amazon, you can find hundreds of fashion models for dogs. 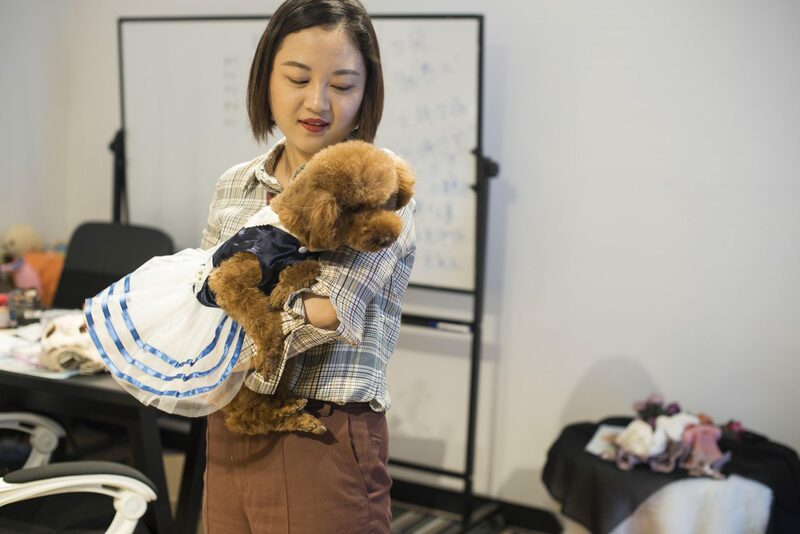 “But this one here – she shows a tutu dress – I bought it for a party at CKU, the Asia-Pacific dog fair that was held in Shanghai in 2017,” she explains. She says: “The dog accepts to get dressed because it associates this fact with going out, just like wearing the shoes”. 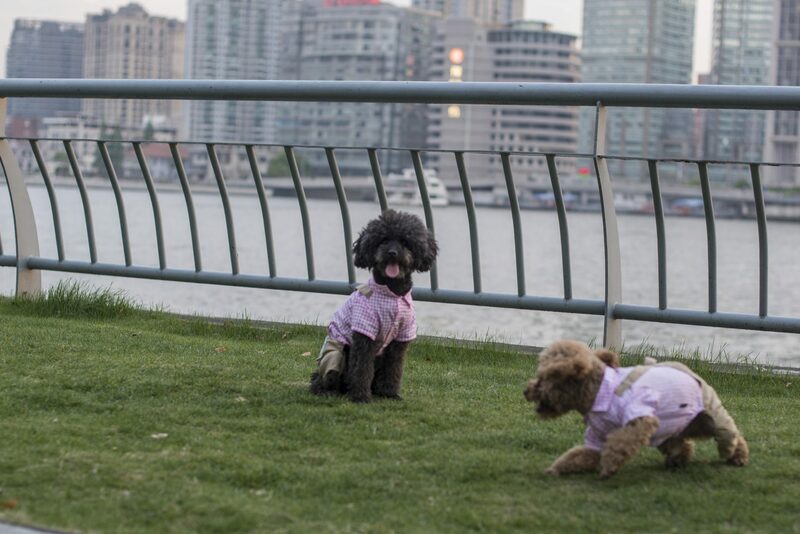 “I think the idea of dressing dogs has been in fashion because we Chinese feel they are more fragile than us and we should protect them, so we wrap them in winter clothes and put on shoes, although they do not need them,” she says. Jiggly eats several brands of food and drinks goat’s milk and eggs “to keep her bones strong”. It is washed once a week in a store (for about 40 or 50 yuan) and has its hair cut once a month for 100 yuan. The spa is 300 yuan. Kedy explains that they have a community in Wechat (the Chinese WhatsApp) for dog owners where they share ideas and sometimes make hangouts, “so that the dogs have a social life,” she jokes.